I’ve noticed that with some, but not all, third party Styles that I have installed in Affinity Photo that they can display incorrectly in the latest v1.6 releases. The culprit seems to be Metal Acceleration, as turning it Off corrects the issue. The screenshots show how things should look and how they look with Metal Acceleration turned On with effected Styles. As you can see it’s a mess! 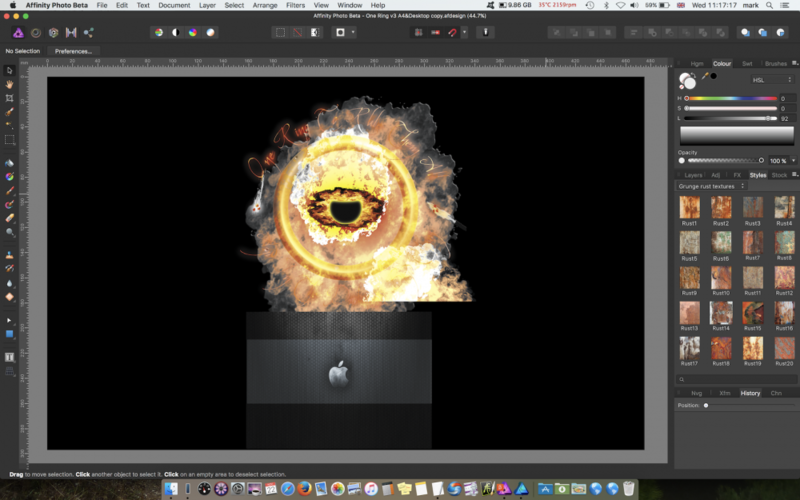 Also the thumbnail cogs in the Styles panel of any of the effected Styles change to square thumbnails. 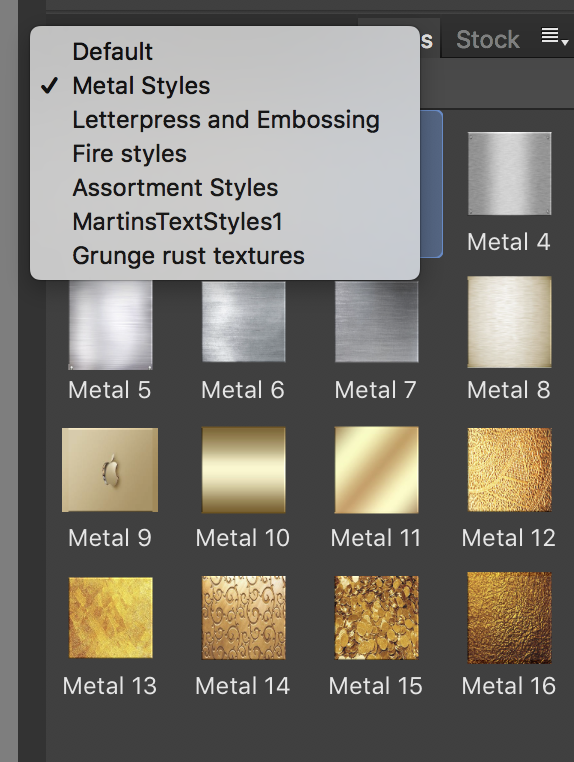 Metal Styles, Fire Styles, Grunge Rust Textures. From where did you download these styles so we can try them here? Can't check this, since I have only AD here on my side and further an older iMac running El Capitan without Metal Acceleration GPU capabilities. - However, under my AD installment (...where these styles have been once created with AD v1.5) things look still Ok with AD v1.6 and OpenGL. 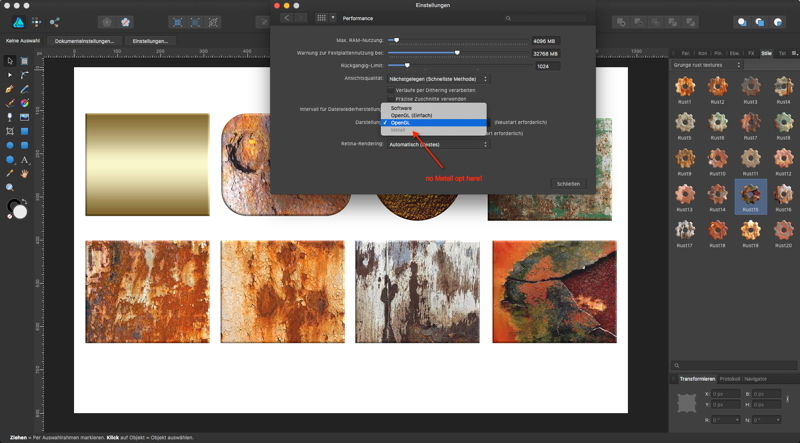 Do you mind uploading the .afdesign files being shown on your screenshots using this link please? Just to reiterate, all Styles display as they should in Designer. As it has no option for turning Metal Acceleration On/Off like Photo dose, I assume Designer dose not use any acceleration and hence why I only see the problem in Photo. 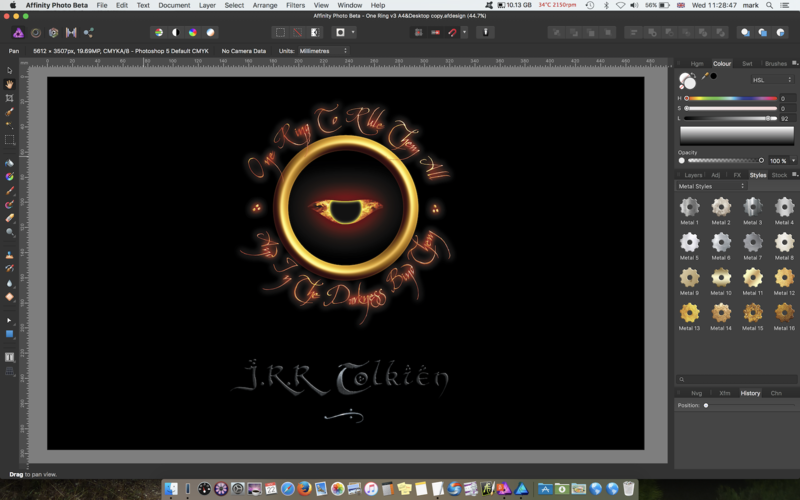 I don’t have my work Mac with me right now but hopefully can upload the relevant files to you tomorrow sometime. Files uploaded. Hope they help. Just wondering if there's any more news on this? Is the reported bug still unresolved? Hi Alfred, yes it was fixed some time back. Are you seeing it happening again? Hi﻿ Alfred, yes it was fixed some time back. Thanks for your reply, Mark. I’m on Windows, so I’ve never seen the issue! I was brought back to this thread by a ‘Like’ notification, and when I got here I found your unanswered post from December 2017, asking if there was any more news.